The Shadow is the ultimate in German engineering and modern sound. Finished in a simply beautiful black nickel plate with hand engraving unlike anything ever seen before. 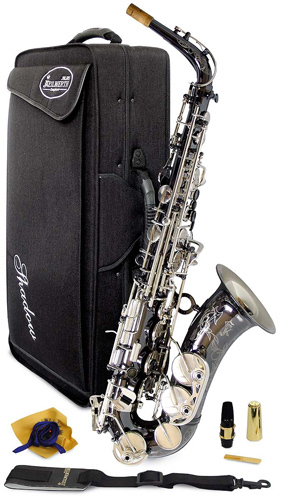 Huge sound, great looks and precision engineering add up to a supreme saxophone that demands attention. The SX90R range from Keilwerth utilises tonehole rings that are soldered onto the standard toneholes. This is reminiscent of the old saxes from the USA like Conn and Buescher who also used the rolled tonehole design to create a big warm, full tone. The rolled toneholes also add life span to your pads and can be replaced if necessary in the future. The Keilwerths have quite an individual layout that can at first feel different from your current sax but soon becomes natural under the fingers. These are very free blowing saxes and the sound is yours to mould. Used by many great players including David Liebman and Ernie Watts (for our Ernie Watts interviews please see our Multimedia Page or YouTube).